We are centrally located in the heart of Gympie at 217 Mary Street. The Club opens from 10am to late, 7 days a week. 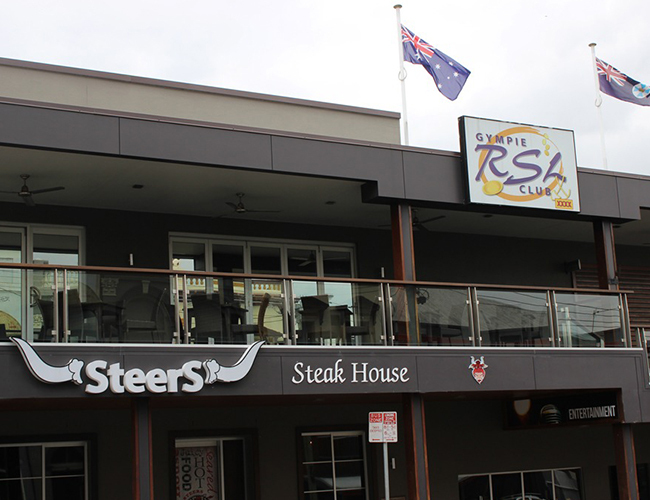 We boast great facilities including a Gaming Room with 80 machines, a Steakhouse, a Coffee Shop, and a Function Room. The Courtesy bus is a service the Club provides to its Members and their guests living within a 10km radius of the Club. To become a Member, simply download and fill in our application form then hand into Reception with ID and payment of $5.50. You can renew your membership annually on the 1st December. To become a Member, simply fill in the form below then visit Reception with ID and payment of $5.50. The Gympie RSL Club is committed to the privacy of your personal information supplied by you in your interaction with the Club under the Privacy Act 1988. The club will collect only the information that is necessary to fulfil its activities of functions. If you are an on-going Member and do not wish to receive promotional offers, the club will, upon the written request, take tour name off the relevant mailing list.